This picturesque group of buildings has been erected during the past eighteen months at Fulham. The style adopted by the architect, Mr Francis, is of that latest phase of Gothic known as the Tudor—a character of design which, in the present state of architectural progress, few persons venture to revive. 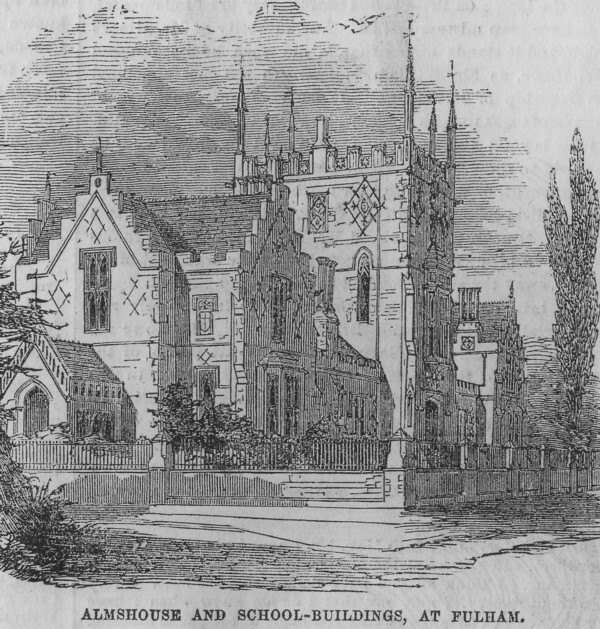 The structure comprises almshouse accommodation, boys' and girls' schools, and master's house. Red brick, with Bath stone for their quoins and dressings, have been used throughout. Step­gabling and embattled parapet-work have been freely adopted. From the centre of the building rises a tower of important dimensions. This is embattled and pinnacled at the parapet, and in plan a parallelogram. The tower contains—above its lower portion, which forms a groined entrance vestibule—a roomy apartment with roof of open timbers in stained deal. The room is lighted by an oriel window, which, externally, forms a striking feature. In the body of the building is a similar room, for school purposes. Here, again, we find the open deal roofing, stone fireplace, and stuccoed walls, the stucco being pointed to represent ashlar-work in regular courses; a falsity with which stucco, being in itself a true and honest material, should under no circumstances be branded.